January | 2014 | My Things - Music history for those who are able to read. Once again, a great edition of the NME with many fine artists interwieved. 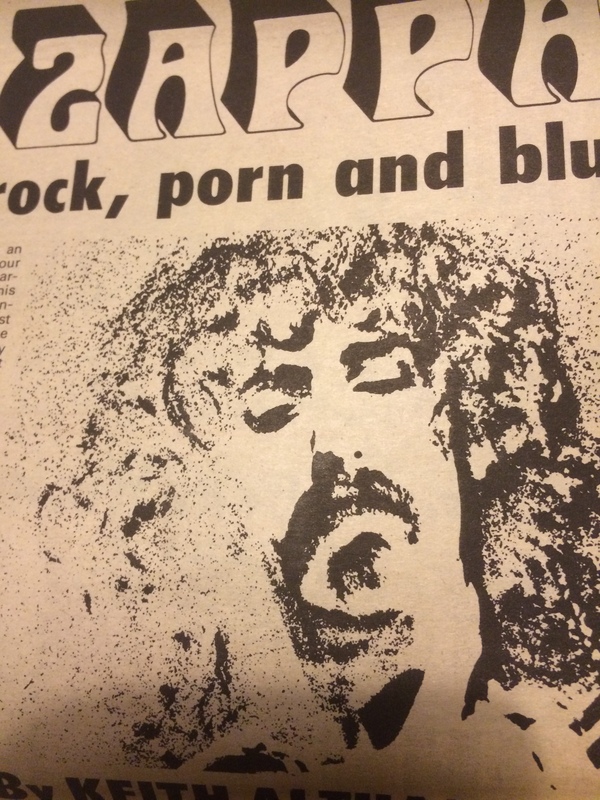 But I really had no other choice than to publish the interview below, as Deep Purple is one of the bands that I dearly love. Such a fine musical legacy – such fine musicians! Enjoy! Q: How has Ian Gillan`s illness affected Purple: I understand he now has to rest considerably. Was it ever suggested you bring in a temporary replacement? “No, we never even considered getting another singer in – no one suggested that. Mind you, a few people outside the band suggested we do some gigs without him. As it was, they almost had to force us on stage in Chicago without him. “I think the rest period was very important, in that when you rest you think much more clearly. The resulting album, “Machine Head”, was 100 per cent better as a result. Was there any special reason for recording the album in Switzerland, which I understand to be the case? “No – we chose Switzerland to record the album simply for business reasons. It wasn`t cheaper, or anything like that. We hired the Stone`s mobile, and that isn`t cheap. And by the time you add up things, like hotel bills, it works out pretty expensive. I`d hazard a guess at £8,000 – as compared to the last one, which cost around the £6,000 mark. “Getting the Stones` mobile was our idea – we`d heard it was a good one, and it cost us around £5,000 for the time we had it. We recorded the tracks from December 6th to 21st, working at least twelve hours a day, and the whole thing was mixed in three days. Why write most of your numbers actually in the Studio. Surely it must work out expensive. Is it always a joint group venture, writing a number? “Officially it`s a five-way split when we write, but different people contribute different things to different songs. We know who wrote what, but I don`t think it`s apparent to the listener. “For example, `Fireball` was written mainly by Richie, John and Ian. The basic ideas usually stem from Richie and myself. “On the new album I got most of my ideas during the four weeks off, just because I was able to take time off and listen to some music and also drive around in my car and relax. 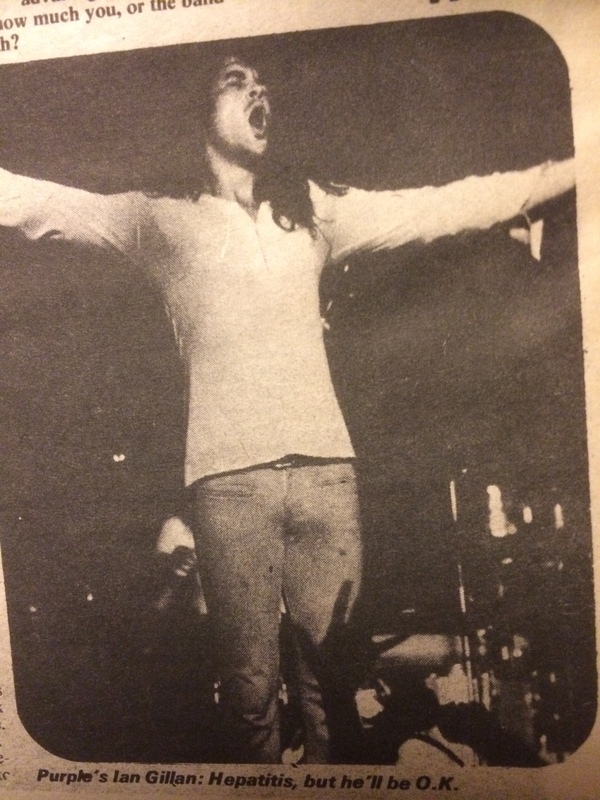 On the lyrics side, sometimes Ian Gillan will do them on his own, or we`ll get together. With one particular track on the new album, `Smoke on the water`, that particular phrase just came to me. My first thought was to write it myself as a folk song. Isn`t it annoying, for those of you who contribute more than others`, to still have this five-way-split on the songwriting side? So many groups split because of personality clashes, and as a group you all seem of incredibly different personalities. How have you managed to stay together so amicably? Do you socialise with each other? “The only one I socialise with is Ian Paice, simply because we live together. Certainly we`re the two best people in the group to live together, the bass player and drummer. More in sympathy with one another. You said earlier that the new album was 100 per cent better. How then does it compare with `Fireball`? “The feeling in the group is that `Machine Head` is the best album we`ve ever made. When you look back, `Deep Purple In Rock` was a good album that said everything we wanted to say – it also had a lot of fire. `Fireball`, was made in between tours. We didn`t have a month off before, like we had with this album, and at times we`d be sitting in the studio desperate for ideas. The end result was technically better than `Rock`, but it didn`t have that inner spark. Have you any thoughts for the immediate future of just becoming a recording group, as opposed to a band who tours most of the time? “I don`t know how long we`ll go on for, but speaking personally I couldn`t be happier in the band than I am now. We still enjoy playing – and when we go on tour, the most enjoyable thing is the actual playing on stage. Sure we drink, and go to clubs and bars, but we try not to drink too much before we go on stage. You`ve got to look after yourself. “Oh yes – and six months ago there were some rumours circulating around about me leaving the group because of illness. Every time we went on stage. I had a bad pain where my appendix scar was. I spent a lot of money going to various doctors to find out what it was, but none of them could tell me. “It got to the stage, in fact, where I was seriously thinking I`d have to leave the band because literally the pain was so bad I was doubled on stage. Being part of a band like Purple must obviously have it`s financial advantages. Do you know how much you, or the band is worth? “As a group we`re probably one of the best paid. For an English gig we get around £1,000, and although that sounds a lot, you`ve got to realise it costs us that a week just to run our business. The expenses are enormous. “We all pay individually for our own instruments, and every six months we go and see our group accountant and he tells us how much money we have. We started off in the red – our management put £20,000 into the group, and it took us till the end of `70 for us to pay it off. “My only thoughts are how incredibly lucky I am. I buy a lot of records, and I have good stereo equipment, but I haven`t really spent that much money. If I`m in a restaurant somewhere, I always want to buy everyone I`m with a meal. “The most expensive thing I`ve bought is my house in Iver, which I`m hoping to move into soon, Ian Paice is the only one who hasn`t bought a house now – I think he`s waiting for somewhere like Buckingham Palace. You were going to take up a career in art at one time – do you ever regret your decision? “No – not at all. Whilst I was at school I made my decision to be an artist, and towards the latter end of my schooling, after two years at art college, I became pretty disillusioned. I gathered I couldn`t become an artist simply because I was told I didn`t have enough 0 levels. “As it was, I had to do a vocational course, and I started doing interior design. After a while I decided to sling it in favour of being in a group, but everyone else said I`d be an idiot to give it up. Whilst I was deciding. I had a nervous breakdown. “So I took her advice, and I`ve always gone by what she said then. I`ve learned that whatever happens, whatever I do, regret never changes anything. This number also had an ad for Wings latest single over a full page. It was written in response to “Bloody Sunday” in Northern Ireland on 30. 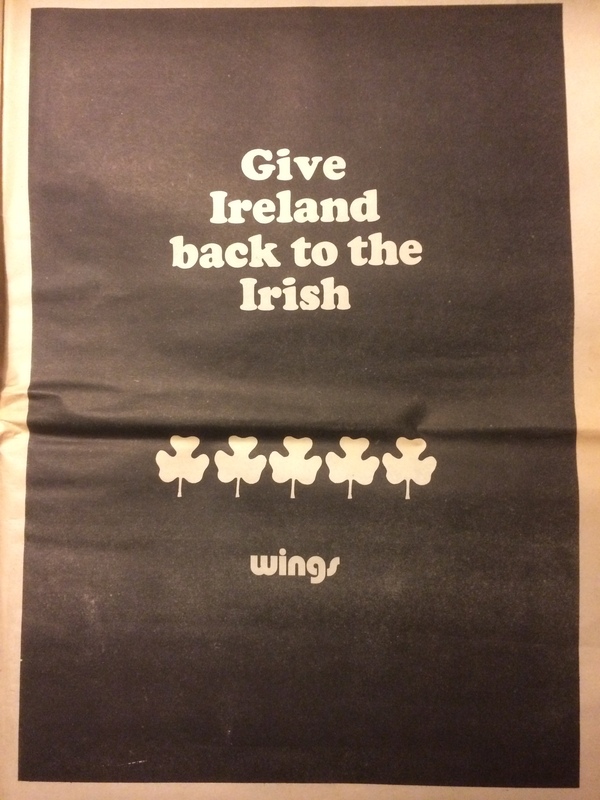 January 1972. This single sparked a lot of controversy and were banned by the BBC and also Radio Luxembourg. 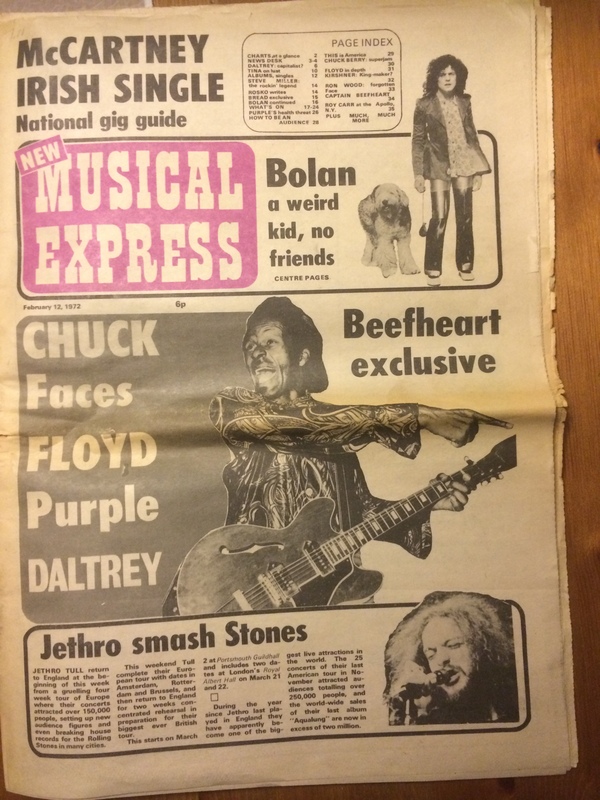 This number of the NME also contains articles/interviews with these people: Roger Daltrey (The Who), Tina Turner, Neil Young, Steve Miller, Bread, Frank Zappa, Marc Bolan, Faces, Chuck Berry, Nick Mason (Pink Floyd), Don Kirshner, Ron Wood, Captain Beefheart and Elton John. 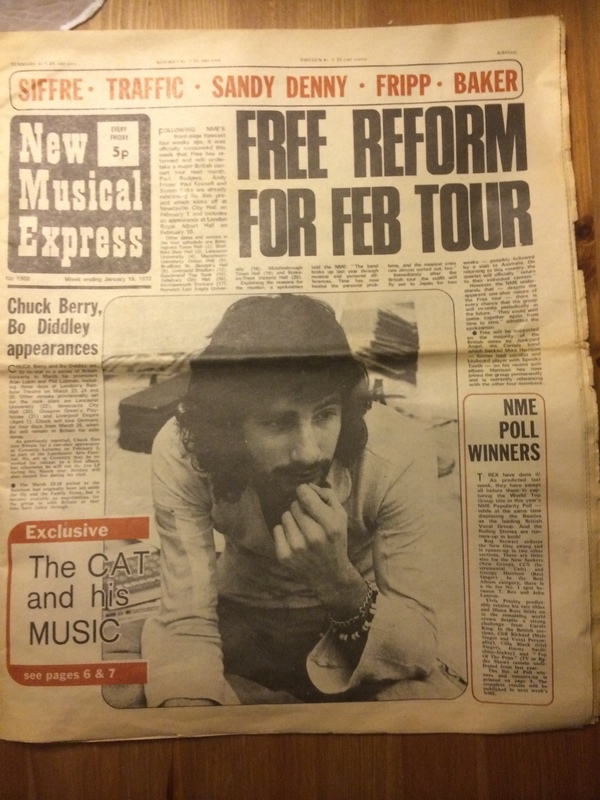 Hope you like this interview from the beginning of 1972. I have personally transcribed this from the original paper and you are free to use it as you like. If you use it on your own webpages – please credit me or put up a link to my blog. If you really like this sort of thing – be a follower of my blog! Thank you! 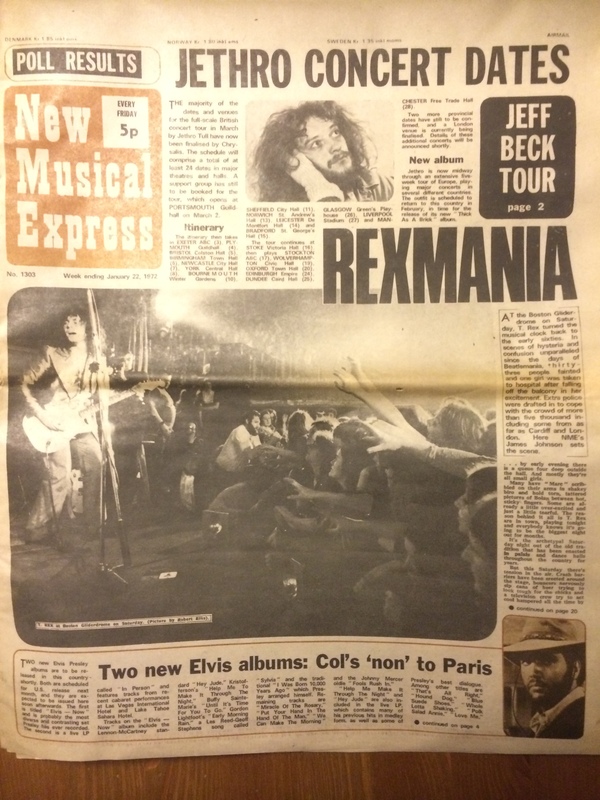 On the day I was to meet David Bowie at his home in Beckenham, Kent, I really didn`t know what to expect. I had heard and seen very little of him recently. The last time I saw him perform was at London`s Roundhouse over a year and a half ago when he showed up unannounced, wearing a gold outfit and curled hair. At the time his music sounded too busy and I couldn`t pick up on it. 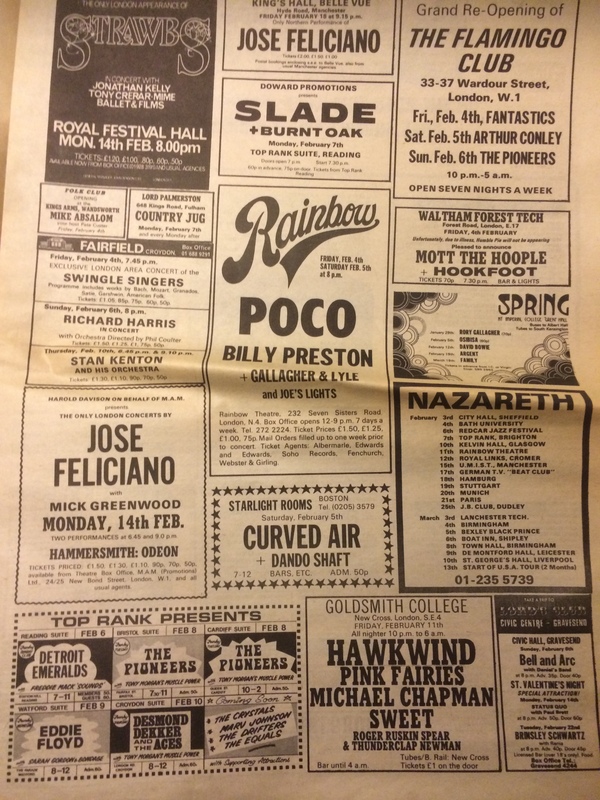 Then came the news that he had written “Oh You Pretty Thing” for Peter Noone, which hit the charts. 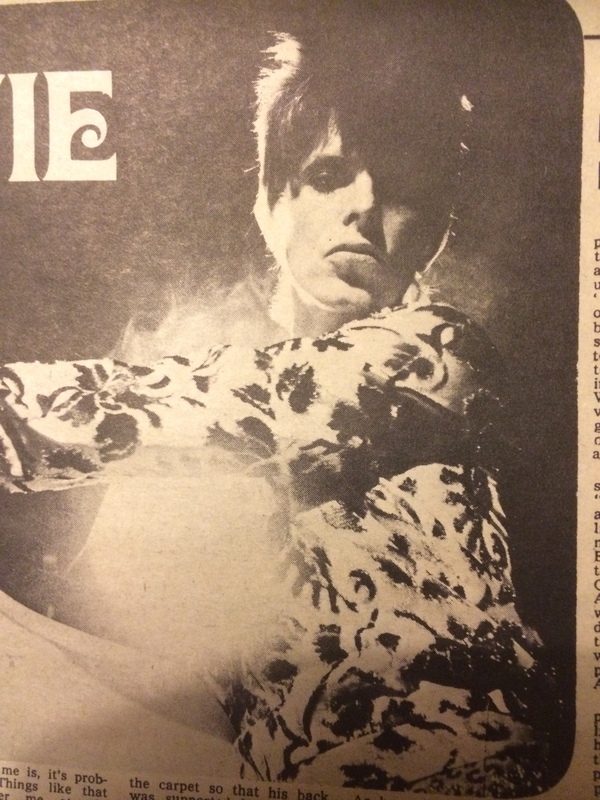 After that came nothing, until news spread like wild fire of an album totally worthy of every praise and exaggeration that Bowie-maniacs attached to it. “Hunky Dory” displays David`s versatility and talents as a songwriter. Does he have any special surprises up his sleeve? “No, I`m not going to pull any big prima donna things like that. I don`t think we need anything like that. Everybody`s expecting me to show up doing an Alice Cooper-type thing. But when Alice came out and I saw what he was doing, I decided to veer away from that angle because I didn`t want to go out and ask people to compare me with Alice. 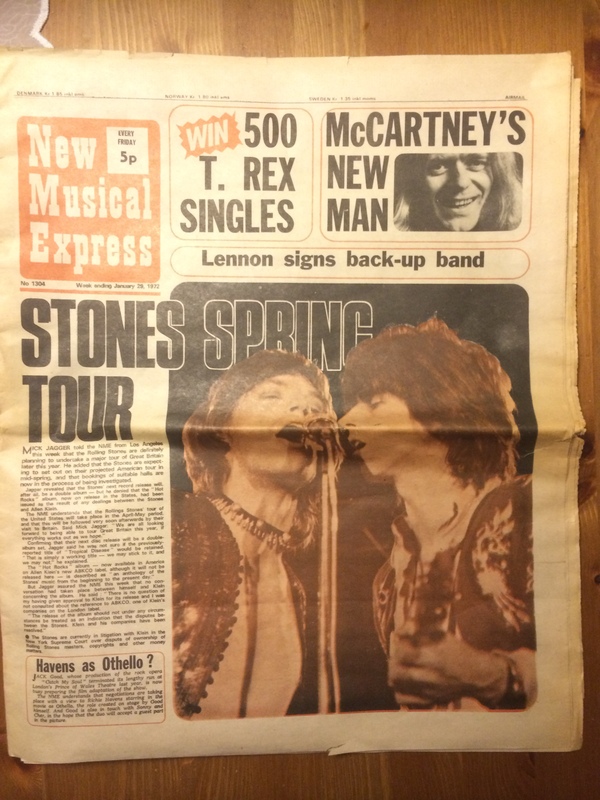 This number of the NME also contains articles/interviews with these people: Rolling Stones, Pink Floyd, Henry McCullough (Wings), Donnie Elbert, 5th Dimension, 1972 Lanchester Arts Festival, Sha Na Na, The Rock And Roll Allstars, Flying Burrito Brothers, Jimmie and Vella and Barry Ryan. 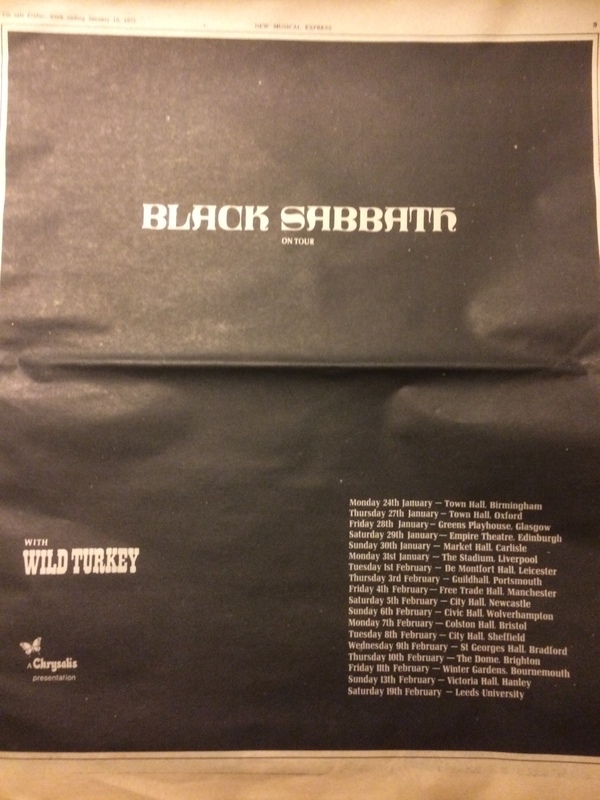 You may remember your disappointment when Black Sabbath had to cancel their first British tour in months at the end of last year. Well, They`re back on the road again, kicking off on Monday at Birmingham Town Hall, when they`ll have a host of new material to offer as well as many of their old favourites. 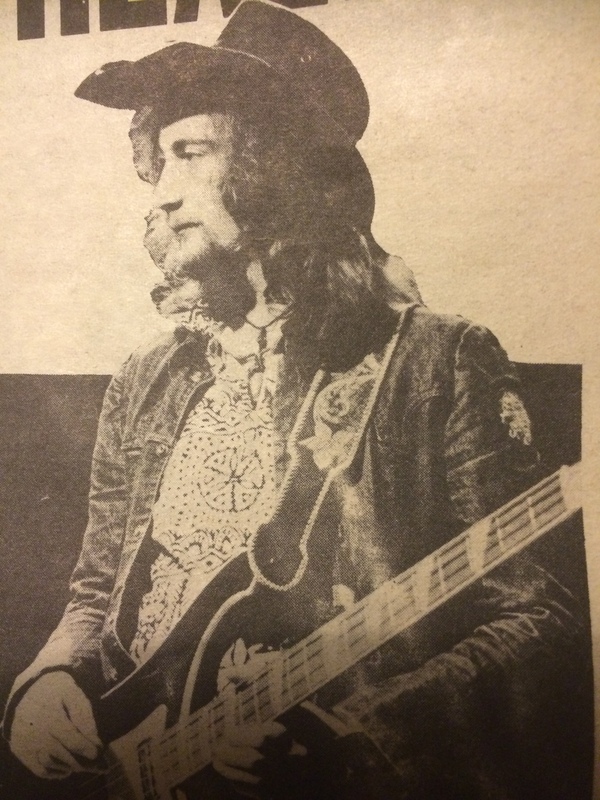 “I`m really looking forward to playing in Britain,” said Ossie Osbourne when I met him on a grey winter`s day in London last week. “We haven`t played here for such a long time and I feel that we`ve let down a lot of our loyal fans. “Unfortunately we`re not doing any London dates. It would have been nice if we could have started the tour in London. We may be doing a separate gig at the Albert Hall later, but there`s nothing definite yet. It was really emotional when we last played there: we`d never enjoyed ourselves so much. “The reason our December tour had to be cancelled was because I was very ill when we returned from the States in November. I had a septic throat and a temperature of about 105 and was out of action for a month. “As a result we`ve been really pushed to get some new material together for our act, and it`s been hard work. Black Sabbath`s fourth album is scheduled for release in April. This time the em- (emphasis? Blog Ed. note) will be on melody, but will still retain Sabbath`s characteristic heaviness. “This album will have a number of short tracks in order for there to be a lot of variety,” Osbourne continued. “I think that long numbers get boring, and if we want to retain our popularity we`ll have to have a change. “As yet we`ve only recorded about half of the backing tracks. We`re getting some weird effects in the studio, and doing insane things. For instance we got everybody to march to the top of this big staircase the other day singing “I-Ho” like the Seven Dwarfs. It was amazing; everybody just let themselves go, people who wouldn`t normally do that. We took it down on tape and are thinking of including it on the album but we`re not too sure yet. It really was an incredible effect. It sounded like there were a million people there. I asked him if there was any chance of a follow-up to “Paranoid,” their immensely successful single released over 12 months go. “I just don`t know,” he said. “We didn`t want to get into the rut of producing one single after another because if you do that you get the wrong kind of image, and apart from that there`s too much to do when you`re trying to get an album together. “Of course, we gained a lot more fans when that was a hit – many of them much younger than our usual followers. But I don`t care if people who come to see us are 10 or 110, provided they come along to listen to the music. “But it drove us round the bend at some gigs. People kept jumping up on the stage and at one Northern date the kids accidentally damaged the speakers because they`d squeezed so many people into the place. The promoters kept letting more and more people in until it was like a gas chamber. Hitler would have had a field day! “Since we released that record we`ve had a bit of extra money, but I think that money is pretty evil. Sure you need it to survive, but it`s brought me a lot of unhappiness. Through wealth you lose much of your identity, and you can`t communicate with people the way you could before. Your old friends look on you as if you`re not there, because they want you to change. “I want to keep as many of my old friends as I possibly can, but you can`t always do that because they change their attitude towards you. What can he see for the future of the band? 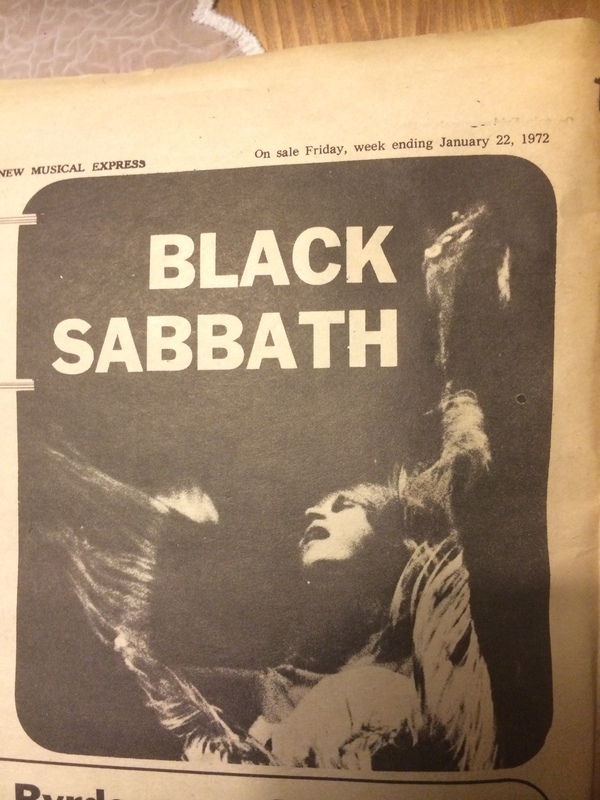 My note: The album Ozzy (or Ossie as he is called in the article) talks about was to be called Vol. 4. Among many die-hard Sabbath fans still regarded as one of, if not THE best album in all of the Sabbath catalog. 3 singles among the 10 best singles of 1971. 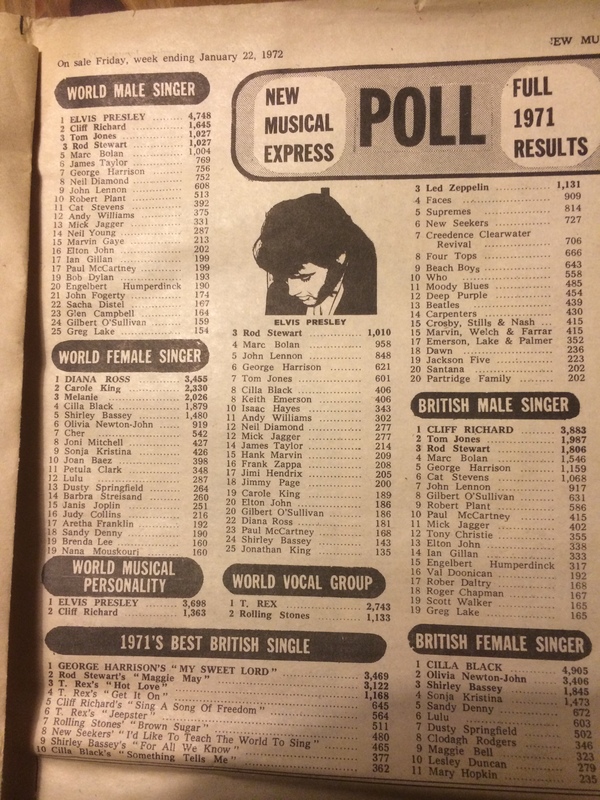 T. Rex is also number 1 in the category “World vocal group”. As voted by the people. 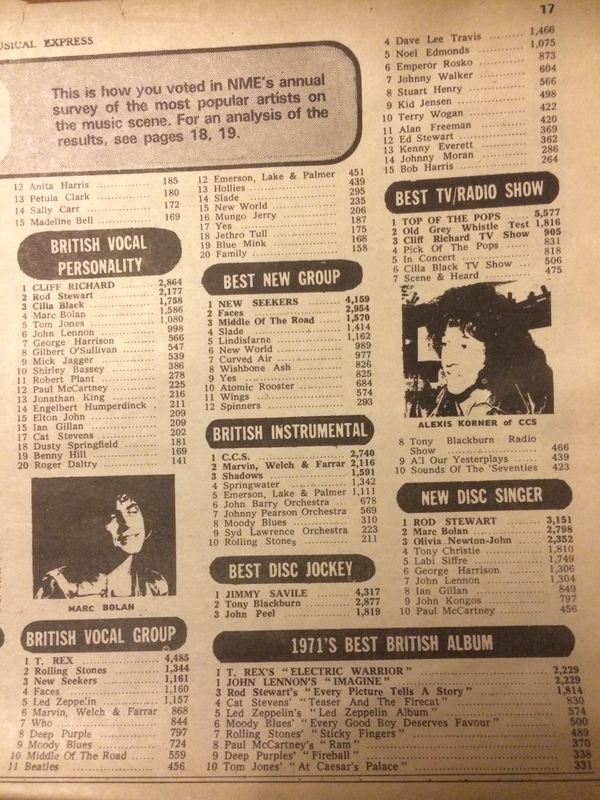 T. Rex shares first place with none other than John Lennon in making 1971`s best British album. Not bad at all, considering what kind of album Lennon made that year. A lot of other big names down that list too. Putting an artist on a pedestal has always been a common practise and the worship of the graven star image a much exploited cult. Once it was the magnified animated reflection on the silver screen, today it is the contemporary singer-songwriter whose every word and gesture is taken as gospel by those seeking some kind of substitute spiritual fulfilment. Such is the frailty of the human ego that many of those directly subjected to this phenomena allow their life-style to be moulded beyond recognition by the lip-service bestowed upon them. Not Cat Stevens. For he states with down-to-death directness “I find that it`s all really nothing more than a great joke. “As far as anything is concerned, be it politics, generals…whatever, it`s all a great big game and you play it the best that you can. That`s as far as it goes.” He stresses: “The important thing is not to take anything seriously. However, Stevens admits that when he doesn`t think along this line, it brings him down. “My most depressing time is when I start getting serious with myself,” he states with complete honesty. “I find that it comes through in my music. I`ll get all wound up in a particular line and I`ll start thinking about it while I`m putting it down on tape. 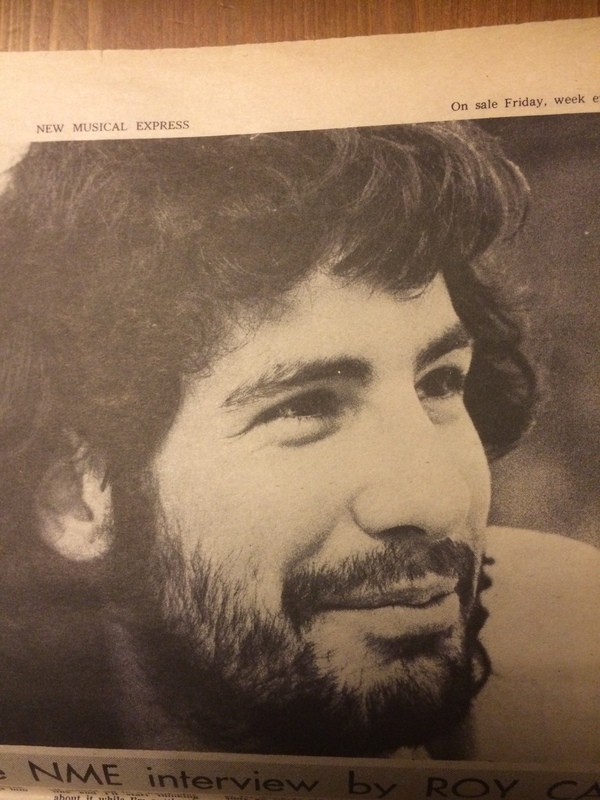 Despite his success, which is still a source of amazement to him, Cat Stevens has remained levelheaded. The paradox is that he is almost the antithesis of his vocation. This trait is revealed in the simplicity of his domestic life, for Stevens has just bought himself a new home. It`s not the expected sprawling multi-roomed mansion complete with a swimming pool hidden away in the green and pleasant heart of the English countryside. It`s a converted split-level terraced dwelling, a mere stall holder`s cry from the busy North End Road street market down at Walham Green. Outside, kids kick a football at the silent crocodile of parked cars – a queue of old ladies with bursting shopping bags form outside the brightly lit Top Rank Bingo Palace – the aroma of freshly baked bread that emits from the corner shop tempers the chillness of the air. When I arrived at Chateau Cat, a gang of workmen were busy bashing, plastering and hammering everything in sight with a maximum of noise. Surely this was not a conducive atmosphere for a prolific songwriter, I commented when I initially came across Stevens seated cross-legged on the floor amongst a heap of books, paints and guitar cases busily cooking scrambled eggs and burning toast on a small electric ring plonked, for the time being, in the stone fireplace on the first floor. “Ahhhh well, being a city lad,” Steve chortled in mock tones, as he looked up from his culinary duties, “I enjoy living in London…in actual fact, I like all cities. Apart from London, the only other city that I`d like to live in though is Toronto. Now that`s a really fantastic place.” Having been exiled myself in that city of his choosing I had to agree. Strange as it may seem, this urban atmosphere of almost perpetual motion in which Stevens exists, nay positively thrives in, acts as a stimulus for his numerous creative outlets. “I like to be as close to the city as possible,” says Stevens, “having all these workmen around me is creating a constant stream of movement…only in that way is my mind free to move. “For me, it`s great to write in a car.” That`s a somewhat surprising statement which I`m sure will immediately destroy any mental visions you may harbour of Stevens seeking inspiration in an aura of etheral tranquility. “It`s great, `cause if I`m being driven somewhere in a taxi, I find that my mind is being constantly taken over by new sights. Therefore, I haven`t got the time to concentrate on any one thing and get lost in it, so I have to think and consequently my ideas are constantly changing. “A car is a great place to write in,” he concluded. Totally aware that the contents of his music reflects the inverse of his turbulant environment, Stevens who until recently lived above his parents restaurant on Shaftesbury Avenue, feels that subconsiously it`s his natural reaction against this background of continual noise. Be that as it may, Stevens takes great and personal care to safeguard his mental equilibrium from the constant pressures which beset an artist of his rapidly growing stature. He admits: “I am my worst judge, or if you like, I am my best judge,” a wry smily etching deeply across his face. ” I`m very self-critical of what I`m constantly doing, all it needs is for someone to say something to spark me off and I`ll most definitely react against myself as to what I`m doing then. However, Stevens still finds time to allow for everyday idiosyncrasies, his most recent being his beard, which he is hurriedly regrowing after having taken razor firmly in hand and succumbed to the overwhelming compulsion to see what lays underneath. “Before I shaved it off, I found that my beard was almost ruling me,” confessed the demon barber. “I was almost frightened to see what was underneath, it got so much that I thought I`ve got to beat it.” A brave man indeed, for I myself have never had the courage to do likewise. Elaborating on the virtues of facial fungi, Stevens is of the opinion, “you find that you can conceal things, not internally, but when you have an open jaw you automatically find that you conceal things within yourself…mainly in your head. Success has turned more heads than a good looking woman, but again Cat Stevens is adamant in his determination to retain a sense of priorities and avoid being sucked up by the destructive superstar syndrome. Even the immediacy of his Stateside acclaim – being one of the few artists to actually show a profit on an initial expeditionary trip to the New World – hasn`t clouded his personal credo. “The trouble is, that many artists become performing puppets, but they don`t know it. They still think they are in control which can be very dangerous because they`ll suddenly blow up and they won`t know why. “The thing I found is trying to get as much control over my life as possible. It`s just a question of you working and struggling for that moment when you`re on top so that you can then do what you want. It doesn`t matter what thing you`re into, it`s just that you`re constantly working to reach that peak. “There are those people who give up at a certain point and that`s something I haven`t done yet. In fact I don`t feel that I`m going to do it for a long time because I have so much energy to give myself that actually works. Conscious of his audience, Stevens is forever striving to present a good concert in the best possible surroundings. To this end, he still avoids performing in those vast American stadiums, where the name of the game is: See How Many People We Can Pull In. “I don`t go in for all that,” says Stevens taking a stand. “They`re only in it for the bread, it`s definitely a bread thing. The only thing is that you do get heard by a lot more people, but then you don`t really because you sacrifice the quality of your performance. They only see the event, that`s all. Now that`s what I call a drag. That`s not what it`s about. “Records are private things, personal things and it doesn`t always mean the same thing to everyone who is listening, yet it has to be heard. “You see, in America a large proportion of the audience comes for the event instead of the artist, now Elton John got caught up in this trap and he didn`t know it at the time. “I guess that`s what festivals were really all about. It didn`t matter who was on, it was a nice summer and you`d go along to dig it because you knew other people would be there. “Honestly, I didn`t expect things to happen in the States like they did. But when I got there everything just felt right. Though I was angry at the time that `Mona Bone Jakon` didn`t get off the ground, but then it didn`t get off here or anywhere for that matter except in France. With astute know how Stevens is instigating his own demand by only doing four week Stateside tours of selected dates at any one time. “I don`t want to play before 40,000 people in a football stadium, because that`s it…what`s the next thing? The performer and writer of such classic music as “Wild World”, “Moonshadow” and “Morning has broken”, Cat Stevens (or Yusuf Islam as he calls himself today) will rightfully be inducted into the Rock and Roll Hall of Fame in 2014. 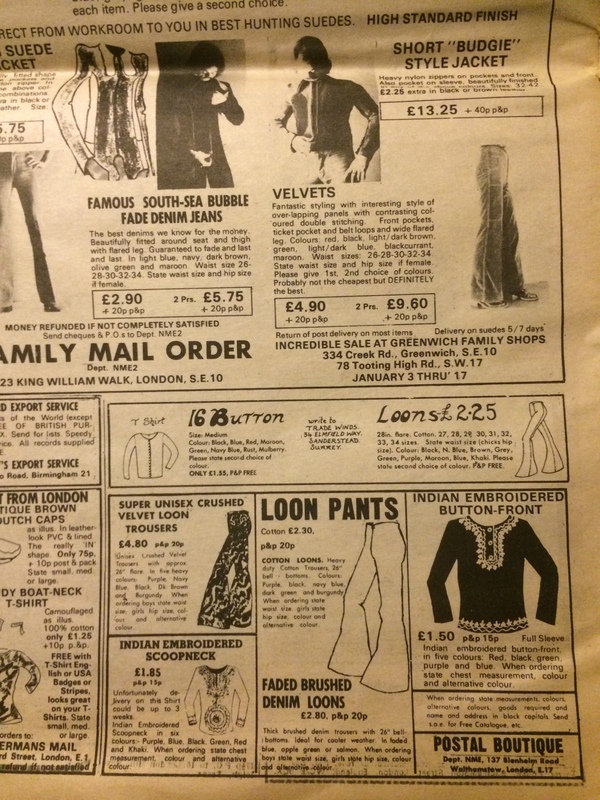 Loon pants were hot fashion at the start of 1972. 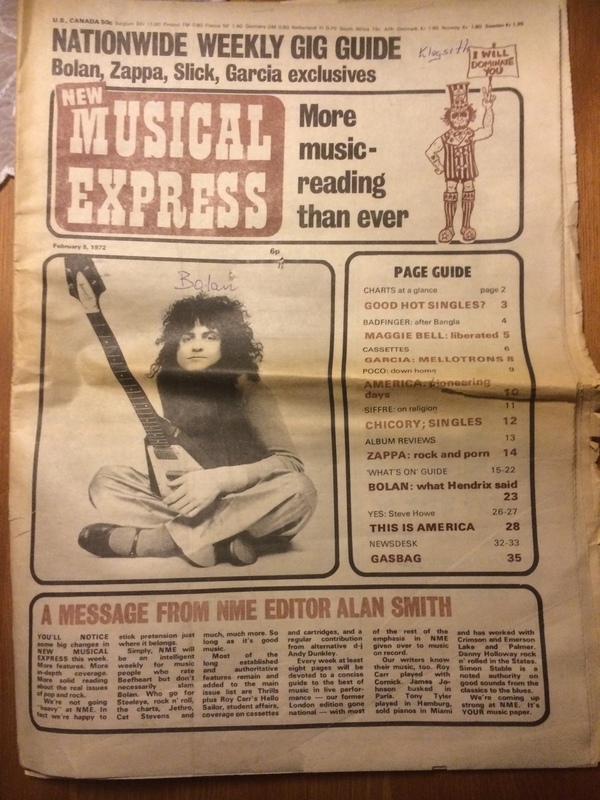 This number of the NME also contains articles/interviews with these good people: Siffre, Ginger Baker, Rick Grech (Traffic), Marmalade, Sandy Denny, Osibisa, Robert Fripp, Keith Moon and Roger Cooke.